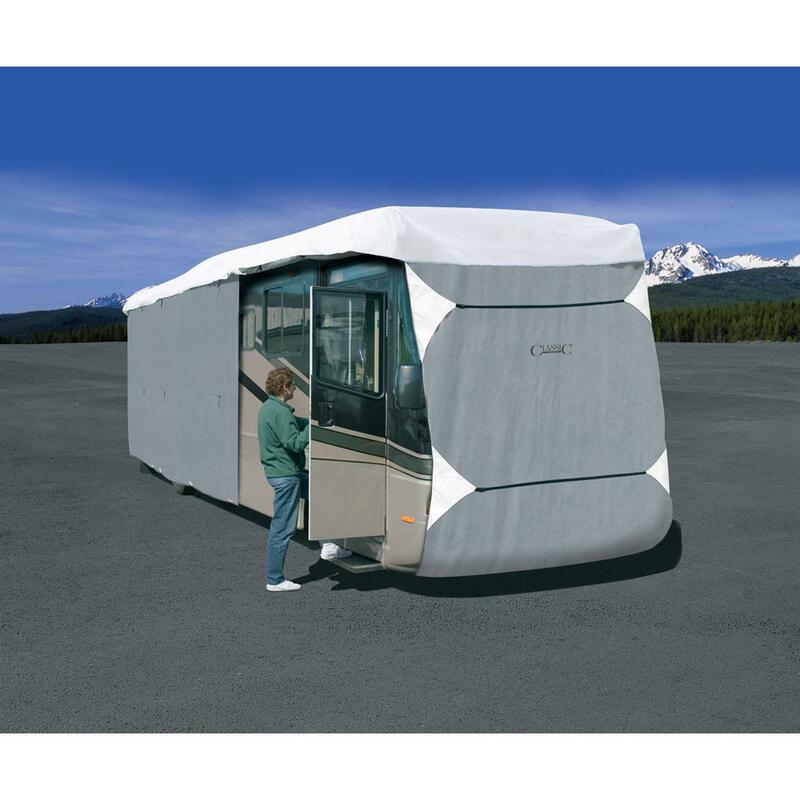 Poly Pro III® Class A Extra Tall RV Cover, specially designed for Extra Tall Class A RVs for complete protection! This cover is like it's custom crafted for your RV! That's because it was expressly designed in every feature for diesel pushers, bus type and newer Class A RVs up to 140" high* and 30' to 42' long. Rugged, U.V. resistant, polypropylene fabric sides. *Note: up to 140" high measured from ground to roof top without including AC units. Overall lengths include bumper and ladder, but not the hitch. State Model, as available in the Shopping Cart. Order ONLINE Today! PolyPro III Class A Extra Tall RV Cover, Gray is rated 4.5 out of 5 by 8. Rated 5 out of 5 by djssnow from Excellent cover!` I have purchased Classic RV covers for over 10 years. I live in an extremely windy area (20-45 MPH) of the upper deserts of California.The air vents on the sides of the Classic covers allow the air to escape and not rip the cover apart.My only recommendation would be to add tie downs on the ends of the cover to prevent the cover from rotating on the RV. Classic Accessories also has the BEST warranty on the market. Rated 4 out of 5 by Iowastater from Good Cover but tears easily This cover works great for protecting the RV's roof and sides. It does not however extend to the bottom of our RV, covering the entire unit. The material is very light and thin which made it easy to install on the RV, but it ripped from the wind within hours after installing and tieing it down. We were able to repair it with duct tape but not sure how long it will last. It does seems to protect from the rain and snow and air particles but it is far from "sturdy". Not sure it was worth the price. Rated 4 out of 5 by Idaho Geary from 40 ' class A motorhome cover Purchased for ease of covering motor home. Was much easier than others I have used due to the lightweight and non-friction type material. Slid over roof components without snagging and most importantly not tearing.Next spring will be the real review, after the winds and snow. Rated 4 out of 5 by hollywood726 from Good cover at a good value Just bought this cover for our new 34' coach. Previously had an Adco cover for our old RV. Sun and UV rays ate up the cover in less than a year and a half. I'm looking forward to see how this cover performs over time. I liked the triple zippers in the front that go around the mirrors. Genius design! The cover was a bit hard to install at first, but after the third time I have the position down and it's much easier to install. The cover could be about 6 inches longer in the middle, but overall I'm satisfied. It's a great fit in length overall for our coach. Protects your tires and wheels from sun damage! Your 5th Wheel needs protection…we can help!